Jan 19, 2017: Any difference between these harddrive models? Mar 28, 2017: I won a Gigabyte 1080 Ti FE and a $750 gift card to a popular electronics store. I have a few questions and I am looking for guidance from you brilliant folks. 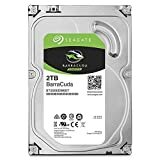 Apr 30, 2017: Are Seagate BarraCudas actually 7200 RPM? May 08, 2017: What might be causing an extremely slow startup time and Chrome taking 10-15 seconds to open on mid-range i7 build? May 12, 2017: Seagate vs Western Digital 2TB HDD? May 18, 2017: Getting ready for my first build. How does this part list look? May 21, 2017: How is this build for home-office use? Jul 31, 2017: With a budget of $1500+, what do I need to set up a studio from scratch? Sep 28, 2017: First time build. need advice. Oct 06, 2017: New PC Build, need other opinions. Dec 04, 2017: Will this harddrive work for my PS4? Feb 26, 2018: [Build help] - configuration for gaming (mainly GW2) and working. Oct 30, 2018: Can I use the other connectors on the cable that powers my drives? Dec 01, 2018: Virtual machine to FreeNAS transfer speed over NFS. Dec 07, 2018: Help with a first time build! Jan 08, 2019: Opinion and thoughts on a new hard drive upgrade? Checking to see if this is actually compatible. Feb 17, 2019: Are these parts compatible? Feb 18, 2019: Are these parts all compatible?? Feb 18, 2019: Are these parts all compatible on amazon? Please help! Feb 18, 2019: Double checking compatibility of parts Please help! Mar 05, 2019: NEED HELP! Apr 09, 2019: Is a hybrid drive faster than a HDD but slower than a SSD?